I know that it is makes no sense to promote a pawn to a bishop or a rook as the queen can compensate for both but a knight is something different. However, the queen is still much more powerful. So what situations would provoke you into promoting your hard-labored pawn to just a knight rather than a queen? Oddly enough, I happened across that line for the first time just earlier today. In this position, 1...b1=N+ is the only move to draw. 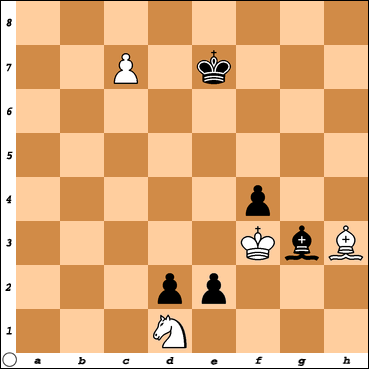 Any other move will allow a quick mate, but after knighting the pawn, black sets up a drawing fortress. I was able to recognize that this is actually a draw because black can play 1...b4 2.Rh4+ Kc3 3.Kc5 b3 4.Rh3+ Kc2 5.Kc4 b2 6.Rh2+ Kc1 7.Kc3 reaching the position above. Due to this, I went into another variation and won. Without knowing this idea, however, it would have been very hard to resist winning my opponent's rook. During round 9 of the Istanbul 2012 Chess Olympiads, at the Nakamura-Kramnik table of the USA vs Russia match, we've witnessed another one of those promotions to knight at move 62 by white. and the bishop on g3 will take the c7 pawn next move resulting in a draw. To avoid that, Nakamura promotes his pawn to a knight with check to save his advantage. Here are 4 different commentaries of the game, pick your favorite one! WTM loses with 1 g8Q? Rxf8 2 Qxf8 Qxf8+ but draws with 1 g8B!! when Rxf8 is stalemate (NB the g8B pins Qf7). 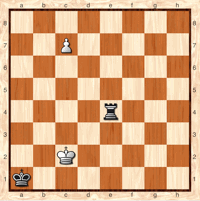 There's a famous study by Rusinek where White must promotes both R and B (as well as N) to guarantee a draw; see the position shown in Rusinek's Wikipedia page https://en.wikipedia.org/wiki/Jan_Rusinek. When you said it made no sense to promote to a Rook or Bishop, it brought this position to mind. Here, if White promotes to a Queen, the game is drawn, but if White promotes to a rook, White wins. on 1. c8/Q Black would answer 1 ... Rc4+ 2, Qxc4 stalemate. But on 1. c8/R 2. 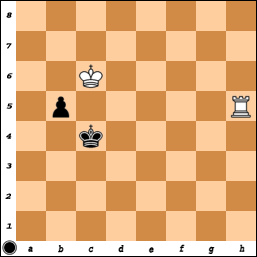 Rc4+ White can capture the rook without fear of stalemate. Sometimes the queen is not the most powerful piece available. Every position is different, and the extra move possibilities of the Queen can work against you sometimes. Whenever you promote, think. Most of the time, yes, a Queen is the best choice; but not always. Look around and see if a different piece would be better, or if there is a danger of stalemate posed by the queen's extra moves. 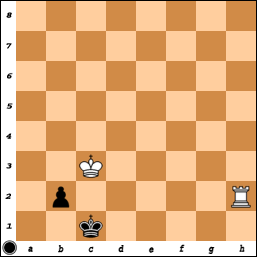 Here is a fun tactic, involving underpromotion, to finish off the game if you are two connected pawns up in a rook endgame. I saw this in an endgame manual a long time ago, but cannot find the source anymore. The tactic is totally unnecessary as white has other ways to win. Still, it's quite impressive. After 1.Rf8+ Rxf8 2.g7+ black doesn't play 2...Kg8 because of 3.Kg6 and mate next move (4.h7#). Instead black plays 2...Kh7 hoping for stalemate. Then 3.gxf8=N+! and 3.gxf8=B! both win, while 3.gxf8=Q?? and 3.gxf8=R?? lead to immediate draw. Here, 29. ... Ba3+!! and promoting to knight could've save the game! Not the answer you're looking for? Browse other questions tagged endgame pawns knights pawn-promotion point-value or ask your own question. How common/important is promotion to knight? Reasons why king and rook mate quicker than king, knight/bishop and bishop?